I’m at the M79 bus stop on Amsterdam Avenue, where the bus has to hang a left turn before heading crosstown. An elderly couple walks up to the stop, haltingly, looking around a lot, loitering in the street. She turns back to her husband, who looks at her, impassively. In early 2006, I was working a suit-and-tie job in the beauty industry, and I felt fat. Well, really, I was fat: I’d climbed back to the highest weight of my life, matching my high in the winter of 2001. That first time, it resulted in a two-week crash diet to fit into a tuxedo for a wedding, which led to six months of powerful weight loss, and I found myself thirty pounds lighter and thrilled. In ’06, I lacked some of the motivations I had five years earlier, but I still wanted to work on my weight. I decided that I’d keep myself honest by weighing myself every day. And I put my weigh-ins into an Excel spreadsheet when I got into work each day so I could visualize my progress. I put “challenge” in the filename as an encouragement. I’ve been jotting down my weight ever since, and in the same Excel file throughout. In 2009, a website and app called the Line Diet popularized this method of dieting, but I just kept at my spreadsheet, adding a fresh tab every now and again, and noting my weight whenever I stepped on the scale. I’m still at it: my last weigh-in was on Wednesday, and it’s in the file. The other day I realized I had accumulated a full decade of health data in one place. So I pulled my charts into a single sheet to see how I’ve done with my weight. The weigh-ins I do have show that I’ve basically stayed in the same 15-pound band for the past ten years. Not bad! And since my last truly heavy stretch, I’ve managed to lose more than 10 pounds and keep them off. This calendar year, in fact, my weight has tracked steadily downward. More importantly, while I haven’t gotten back to skinny just yet, I’ve done well at keeping my weight in check. As of Wednesday, I was back within 10 pounds of what I weighed when I graduated high school, 25 years ago—not yet the slender guy from 2001, but a pretty good place to be. And thanks to my trusty Excel spreadsheet, I’m motivated again to try and get there. The Ideapad turns eighteen today. I first posted here on November 1, 1998, with a nod to Jason Kottke (who renewed his own commitment to blogging today with the launch of a membership program). My blog isn’t the hotbed of activity it was in the early aughts, but it remains a going concern for me, and I remain immensely proud of that. I often wonder how many of the 500 or so weblogs in the first Eatonweb portal are still chugging along—however many there are, this is, and shall remain, one of them. I’m a bit of a packrat with my things, as much as Manhattan apartment living and my clutter-averse wife allow. Most of what I hang onto has some sort of emotional attachment: I have, for example, a bin full of pre-digital-camera photo albums, tucked away in the upper recesses of my closet. This I consider to be useful hoarding. One thing I hang onto, and which I haven’t been able to quite reconcile, is old business cards. Back in the 1990s, I began keeping a proper Rolodex to track the people I knew. I’m pretty sure it started when I was working at Billboard, tracking various freelancers and business contacts, and it was still common to look up a phone number and call someone. I took my card file with me when I left, and for awhile, I continued to maintain it: glue stick, the individual filing cards in the system, culling people when they left their jobs, and so on. At some point, I stopped actively maintaining the Rolodex. But I didn’t stop hanging onto the business cards. And now I have a bag full of them: nearly 20 years of contacts, from longtime bosses to people I met once (I literally have a binder clip of cards from my agency days with the title “PEOPLE I MET ONCE” on it) to all manner of my own cards from jobs past. And now I’m trying to figure out why. This morning, I tried cleaning up the stash. I threw out a few dozen, but the vast majority are still here. Some names give me a flicker of remembrance, which is fun; some are entertaining, like the card from the woman whose bosses called her “Potato” and actually stuck it on her business card; others are former clients, prospects, or connections, people whose encounters with me made my life however much richer. And still. It’s not like I’m talking to more than a few of these people, nor have I, some in literally decades. I found a handful of contacts I’m debating reaching out to anew, and a lot of cards that I’m keeping for keeping’s sake. I am slowly coming around to the fact that this is a bit ridiculous. But I haven’t thrown them out just yet. Surely, some of my old business cards will be good for a good-old-days chuckle someday. The rest, though? Sooner or later, I’ll wish them all goodbye, their utility vastly improved by LinkedIn and Highrise, and their tenuous memories forever abandoned. For now, though, Potato, I still have your card. Maybe I’ll give you a call. This Sunday I activated my latest iPhone, a space-gray 64GB iPhone SE. I’ve actually been hanging onto my old phone for an uncommonly long time. It was an iPhone 5, with scratches on the glass and a connector that was losing its ability to connect, making every night’s charging a dicey proposition. But I’d held out for one important, fundamental reason: size. I’ll admit what Donald Trump won’t—I have fairly small hands. 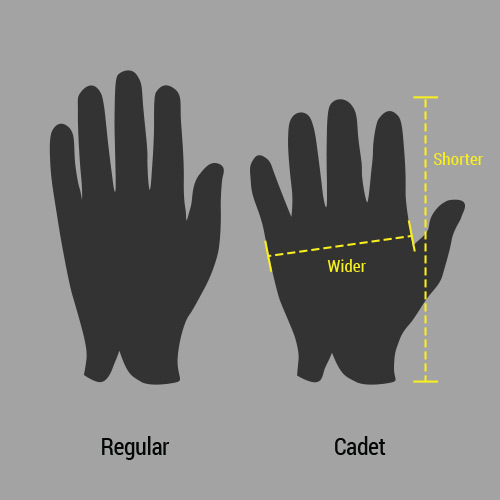 Specifically, I have a wider hand with compact digits, what the golf glove industry calls “cadet” dimensions (which always makes me feel like I’m 14 when I buy a new glove, but oh well). You can guess what someone with hands like the one on the right might feel about an oversized smartphone. I didn’t even like it when the iPhone graduated to 4″ from 3.5″, because it became somewhat hard for my thumbs to reach the top row of icons. I regularly use my device one-handed, so the iPhone 6 and 6S were not what I wanted. The SE, on the other, um, hand, is exactly what I wanted. Updated hardware, updated features, and still the compact size that I could palm with ease. The design may not be as slim as the 6, and its longevity makes it feel a little bit dated, but it’s also a near-perfect design execution, and not at all something I mind re-upping. And, of course, the SE delivers: fast, easy, familiar performance that embodies a good upgrade. The battery life is phenomenal, too—I’m on an every-other-day charge cycle so far, which I haven’t achieved since, I think, my iPhone 3GS. Hanging onto my phone far past the standard replacement cycle makes me appreciate it that much more. It’s been a great buy for me, and I’m glad Apple saw fit to release it. I also picked up a Ringke Snug-Fit case for the SE. I need a case—my kids are clumsy, and so am I—but as a pocket-carrying user, I need a slim one. The Ringke is nearly identical to my previous Case-Mate Barely There, but it’s actually a little smaller (albeit lacking the shock absorption that the Case-Mate includes). By making my new phone just a touch thinner, my phone feels that much newer, and for all of $9.99. So make that two happy purchases, not one. I have a bit of a thing for father-son baseball experiences. So when I saw that Justin Verlander was pitching for Detroit this weekend against the Yankees, my mind immediately flashed back to a Friday night last spring. Alex Rodriguez sat at 2,999 hits on a Friday morning with Verlander taking the mound. A-Rod hits Verlander hard: .344 in 32 career at-bats with five home runs. So on a few hours’ notice I bought two tickets for the game, mostly for my son, Nathan, who despite his father’s repeated exhortations loves A-Rod. (“Well, Jeter’s my favorite Yankee, but since he doesn’t play anymore, A-Rod is my favorite. He cheated but he learned his lesson and now he’s a really nice guy.” Sigh. How about Gardy?) Our anticipation was that by being opportunistic we might be able to see a bit of history. What we hadn’t quite anticipated was barely having settled into our seats when Rodriguez turned on a first-pitch fastball and blasted a home run for hit number 3,000. The hit came in the bottom of the first inning. (That’s Rodriguez at the plate behind Nate in the photo above, seconds before Verlander’s pitch.) It was what the crowd had come to see, and it made for an early peak to the game: the two men next to us literally said goodnight and left, their plans fulfilled. Nate and I stayed for the whole game, though, and even found some friends in the bleachers in the late innings. I brought home our souvenir popcorn bucket and affixed a ticket (a real one, picked up at will call) to the underside as a memento. I still don’t like Alex Rodriguez, but I love having constructed this memory–from the hit to the homer to the very late night for a seven-year-old at the Stadium. So we’re good. Even if Nate still thinks A-Rod has three thousand homers, not hits. Go Yankees.